Ian was having a really bad night. He just kept crying and crying in his crib, no matter what I did to pacify him. I think in the end he just wanted me to bring him downstairs, and that wasn’t going to happen at 10:30 pm. He finally fell asleep, and I was able to relax for awhile by watching the NEW Hawaii 5-0 on television – yessss. About an hour later I heard the front door open. I knew that Grace was getting ready for bed in her room. Our kids were all nestled in bed upstairs. Our neighbor friend Yasko will always open the door and right away say, “Hello” so I don’t get freaked out. But no one said hello; I just heard them move to the living room door and open it. It was ERIC! Home 24 hours early! He hadn’t picked up when i had called about Ian crying – now I know why. he was on the train on the way back; he took a taxi from the station and surprised me to pieces. The most wonderful surprise. The one story I want to share tonight is about the next-door neighbor to the Be One home. I wrote earlier about her comments to others that the Be One people are fixing up everyone’s homes before their own. On the last visit, she had told Eric that she is hoping to get someone to help fix her roof. During the tsunami, the water had lifted up her big metal storage shed and rammed it into the roof, also smashing the rain gutter. She didn’t know when she could get someone to take care of it. 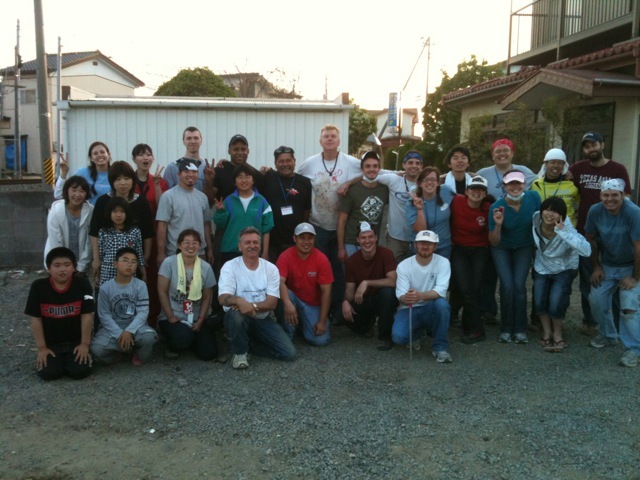 This week there has been a construction team from the U.S. working on the floors of the Be One home. God’s providence had sent George up with Eric last weekend – his company does wood fittings and floorings for home — he was able to assess the flooring needs from a Japanese perspective, visit shops nearby that had the right goods, and arrange for visits this week from the companies necessary to make things happen for the construction team to get the floors in. He wrote me an email that expressed how thankful he was to KNOW that God wanted him up there last weekend for this exact timing. Back to the main story. Eric mentioned to the construction team the roof of our friend next door, and they got on it. Chad’s brother Matt is heading up the crew. They did a beautiful job repairing her roof and rain gutter; she could not adequately express her thanks. Over the past few weeks she had delighted in serving the team in different ways — bringing them popsicles on a hot day; preparing and serving fresh octopus, bringing them drinks… It has been a mutually enjoyable relationship between the team members and her. Today when Eric was visiting the work site, Mrs. K. brought her son and his wife over to meet the whole crew. Her son thanked the team repeatedly for all they had done shaking hands with everyone there. He stood there looking at the team not moving until he lifted his hands toward his face to wipe away tears. Then his shoulders started heaving and he started sobbing uncontrollably. So the construction team surrounded him and gave him bear hugs (I’m crying as Eric is telling me this!). Then the son shared how he and his wife had lost their home nearby (about ten minutes away) in the tsunami; but because his job was down in Sendai (about an hour south), he and his wife had to live in an evacuation center down near his job. He expressed his regret at not being able to do anything to help his mom during the recent months. We realized that his tears were of gratitude for how the team was taking care of his mom. She had asked Eric if it was ok to give her son one of the remaining fans from the twenty five that she had secretly passed out at night. The team was so glad to give him one to take back to the evacuation center. We pray that these relationships will continue to grow; that hope will keep rising. All praise to our Father for the work of healing and redemption that He is doing in the midst of what had only held despair. This is Tina Campbell, Allison’s friend. We’d like to make a donation to your ministry to help with post-earthquake needs. Should we do that through the Asian Access website? Please advise.